This paper surveys existing measures of economic openness understood as the degree to which non-domestic actors can or do participate in a domestic economy. 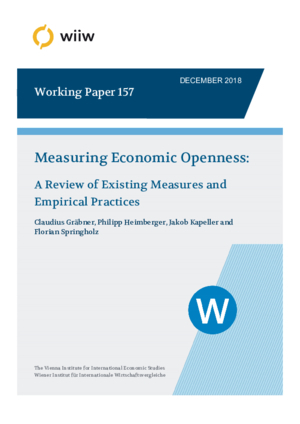 We introduce a typology of openness indicators which distinguishes between ‘real’ and ‘financial’ openness as well as between ‘de facto’ and ‘de jure’ measures of openness, and show that this classification indeed captures different dimensions of economic openness. The main contribution of the paper is to supply a comprehensive and novel data set of openness indicators available for interested researchers. Based on this effort, we analyse some trends in economic openness over time and provide a correlation analysis across indicators. Finally, we explore the practical implications of choosing from different openness measures within a growth regression framework and highlight that researchers should make the choice of the indicator based on explicit theoretical justifications that correspond to their specific research questions. We provide the descriptive statistics for all data used in the paper in section A. Section B gives a more detailed analysis of the individual time series, including a test for their stationarity. We then rank countries according to their openness in selected indicators, as well as the discrepancy between their de facto and de jure openness in section C. In section D we describe how we grouped countries for the analysis in section 3 in the main paper, and provide for the ﬁgures with countries grouped according to their level of income (section E). In section F we replicate the correlation analysis of section 4 in the main paper using the Pearson instead of the Spearman correlation coeﬃcient.